Evangelical Lutheran Seminary of Canada faculty member. 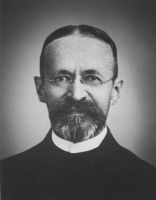 Lincke was acting president of the Seminary from 1911-1914. [S348] Census - ON, Waterloo, Woolwich - 1911, Div. 14 page 12. [S192] Cemetery - ON, Waterloo, Waterloo City - Mount Hope CC#4500 Internet Link.